Businesses in Penrith are rapidly turning to enhanced security technology and security cameras to avoid theft and stock destruction. Penrith has one of the highest robbery rates in the whole of NSW with 71 armed robbery incidents occurring in the 2015/16 financial year. Recent increases in crime targeting businesses have resulted in many business owners looking for a more secure solution. The advancements in technology like remote monitoring means you don’t always have to be present to have a secure business. Here are three reasons business owners in Penrith are installing security measures in their businesses. Businesses are in a vulnerable position especially when it comes to theft. The tricky conundrum where stock needs to be on the premise but it is also left unattended at night is obviously a great target for opportunistic thieves. In 2011, Penrith experienced 608 incidents of breaking and entering. By adding cameras and other security technology businesses will create a visual and practical deterrent for thieves. Cameras also can have the benefit of capturing footage of thieves or vandals. that can be handed over to the police. It is not only the huge national chains and supermarkets that have a rampant problem with shoplifting. Small businesses in Australia tend to lose around $90 worth of stock each shoplifting incident and the Bureau of Statistics has found that in 2011 there were around 1.2 million shoplifting incidents each year. Shoplifting also comes with hidden costs like time spent dealing with police and the culprit, time spent re-counting stock, briefing staff and re-training staff to deal with theft. 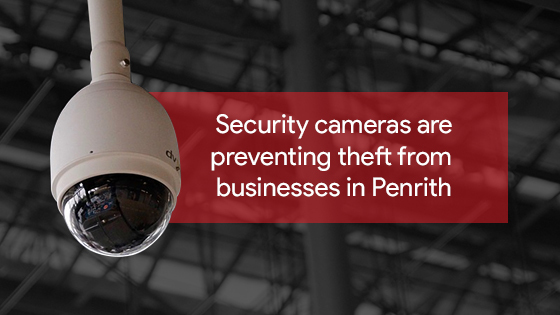 Businesses in Penrith who have installed security cameras are potentially saving themselves $25,000 a year. Sadly, it is not just the bored teenagers looking for a thrill that you need to be worried about. Keisler International conducted a survey in 2013 that found 95 percent of employees admitted to stealing from an employer. Obviously hiring people you can trust or having a smaller close-knit staff can limit employee theft. But that might not be an option for rapidly growing small businesses or ones that are remotely managed or franchised. This is why having cameras in all areas of the premise is preventing theft for businesses in Penrith. On top of these statistics there are daily reports of armed robberies, shoplifting and smash and grabs in the Penrith area. Protect your assets and your property by having a security system with cameras installed. As a business located in Penrith we understand the area and can provide the best solutions to secure your business. Please get in touch to discuss your options on 1300 13 40 33.